Dancers rehearse for the premiere of “wishdust,” by faculty member George Staib and his company Staibdance, running Oct. 19-21 at Schwartz Center for Performing Arts. The Emory Dance Program presents “wishdust,” a world-premiere work from faculty member George Staib and his company Staibdance. “wishdust” runs Oct. 19-21 in the Dance Studio of the Schwartz Center for Performing Arts. Set designer Leslie Taylor and lighting designer Gregory Catellier will transform the Schwartz Center Dance Studio into a desolate space shadowed by a massive abstract tree. Dancers and musicians move through a landscape peppered with hanging pomegranates, Armenian symbols of prosperity. For Staib, they are also perfect internal worlds, housing sweet possibilities and unattainable goals. “wishdust” is a major collaborative undertaking for the company. The celebrated Vega String Quartet will perform selected classics as well as an original composition by Emory music faculty member Richard Prior. Pianist Kendall Simpson will also perform live and Atlanta-based electronic musician and composer Ben Coleman will create and mix soundscapes in real time. In an environment where sound, movement, light and scenery create shifting dreamlike states, Staib finds parallels to his experience as an Iranian-born Armenian transplanted to rural Pennsylvania. From this dichotomy, “wishdust” ponders willingness, determination, giving up and wondering what could have been if things had been different. 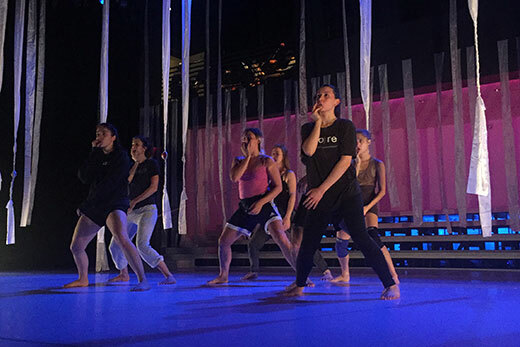 Staibdance premieres “wishdust” at 7:30 p.m. on Thursday, Oct. 19, with performances Oct. 20 at 7:30 p.m. and Oct. 21 at 4 p.m. and 7 p.m. Tickets are $20, $15 for discount category members including Emory faculty and staff, and $8 for students. Tickets can be purchased from the Arts at Emory Box Office in the Schwartz Center for Performing Arts, by calling 404-727-5050, or online.